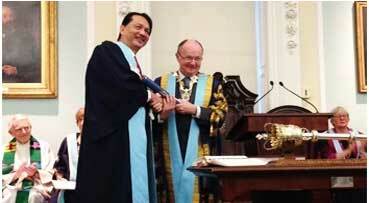 Health director-general Datuk Dr Noor Hisham Abdullah has been awarded the Fellowship Ad Hominem of the Royal College of Surgeons of Edinburgh (RCSEd), Scotland. Dr Noor Hisham received the fellowship during an induction ceremony in Edinburgh Scotland on Feb 2, cementing his place in an international network of over 17,000 fellows and members of RCSEd which has a history dating back to 1505. "For a surgeon and an administrator, receiving the Fellowship Ad Hominem to the world's oldest and largest College of Surgeons is indeed the highest honour and a lifetime achievement that one can achieve,” Dr Noor Hisham said in a telepjone interview from Edinburgh. "More importantly, this award is a global recognition from my international peers at the highest level. I am deeply humbled and excited at the same time by this honour for me and my country,"
He was recently appointed to the Executive Board of the International Society of Surgery (ISS) as the Councillor at Large (2017-2021), making him the first Malaysian appointee to the Board of this prestigious international society and took over as chair of the Global Surgery Committee of ISS in December last year. Dr Noor Hisham has been awarded with many local and international awards including the Fellowship of the Academy of Medicine Malaysia (2004), an Honorary Fellowship of the Royal College of Physicians London (2012), Honorary Degree of Doctor of Medicine from Newcastle University of Medicine, Malaysia (2014), Honorary Fellowship of the Academy of Family Physicians of Malaysia (2015), Honorary Fellowship of the International College of Dentists (2016) and Honorary Doctorate in Medicine from Management and Science University (2017). He received both his undergraduate and postgraduate degrees from Universiti Kebangsaan Malaysia and completed his fellowship training in Breast and Endocrine Surgery from the Royal Australasian College of Surgeons (1997-1998). Dr Noor Hisham, who still practices in Hospital Putrajaya as a Senior Consultant in Breast and Endocrine Surgery, is a world-renowned endocrine surgeon, mainly due to his ground-breaking techniques and approaches that helped shape the landscape of thyroid surgery internationally.